Many low-risk trade ideas (i.e. trade theses that are suitable for tight stops) have presented themselves during today's ebullient markets. One of these is to short copper futures (/HG). 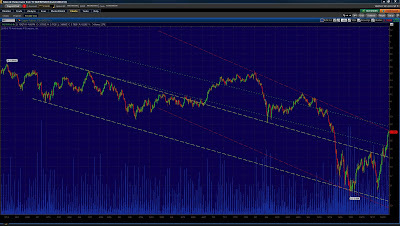 Here's a chart with 4-hour bars, stretching from early 02/2011. The upper line of the red price channel is nicely defined, exactly touching 3 important highs. The bottom line is not well defined, though its slope is significant in other portions (not highlighted above in any way) of the chart's price action. 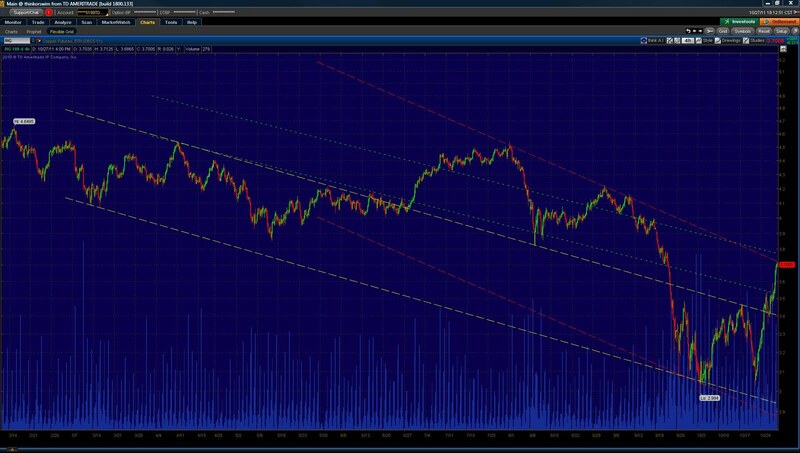 As mentioned, this trade thesis has a tight stop: penetration of the upper line of the red price channel, i.e. about $3.73. One potential profitable-exit point is the lower line of the green price channel, i.e. about $3.52. Of note, copper futures are normally presented, as is my understanding, in dollars-per-tonne (1 tonne = 1,000 kg, but 1 ton = 2,000 lbs = 907.19 kg). This observation is based on usually seeing copper futures prices quoted in the Financial Times; thus, it's a British perspective. This is relevant as /HG quotes copper in dollars-per-pound; thus, the futures price is not in the range of several thousand dollars, as might be expected, but rather only a few dollars.